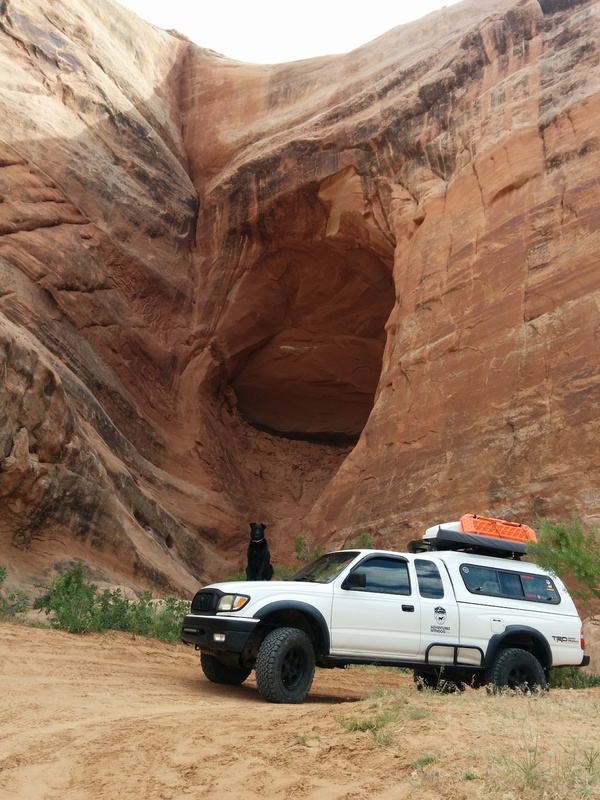 While we were staying at our spot in the Castle Valley we decided to explore the surrounding area and tackle some of the offroad trails offered. 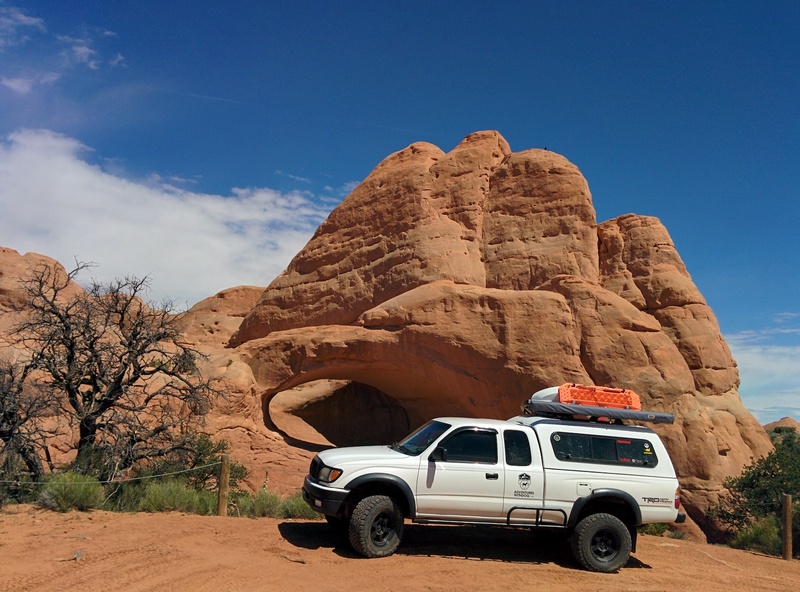 When we were at the Overland Expo West in early May we knew we would eventually end up in Moab and so picked up a copy of the the book Guide to Moab, UT Backroads & 4-Wheel-Drive Trails 3rd Edition from the vendor’s tent. During down time between bouts of walking from one end of the fairground to the other looking at all the cool overlanding-centric offerings and buying too many of them we would head back to our campsite, sprawl out in our zero-gravity chair and look through the pages of this book. We made a list of the included trails we thought we would have the time, the skill and the vehicle to undertake. 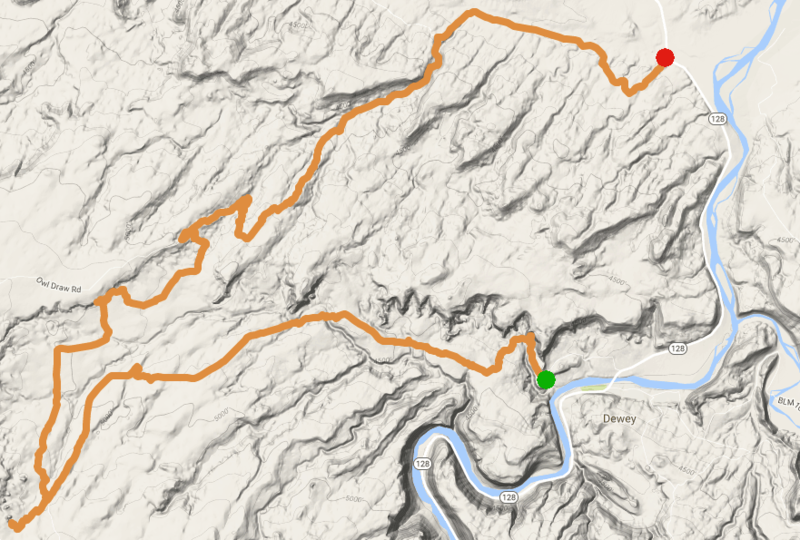 Being in no mood for guaranteed body damage or to have crucial pieces of our suspension break we initially focused on the “Moderate” rating and found the Dome Plateau route. The trail looked like it covered a nice portion outside the border and along the northern edge of Arches National Park. Reading the brief description of the route we were told of old mining cabins, arches, caves and springs with the actual 4-wheeling part having some steep, rocky sections and a few challenging ledges. Sounds good. Now that we were situated in the area we were up to try that out. We headed the 5 miles from our campsite back out to Highway 128 and turned right towards the trail head which was a further 14.5 miles North on 128. 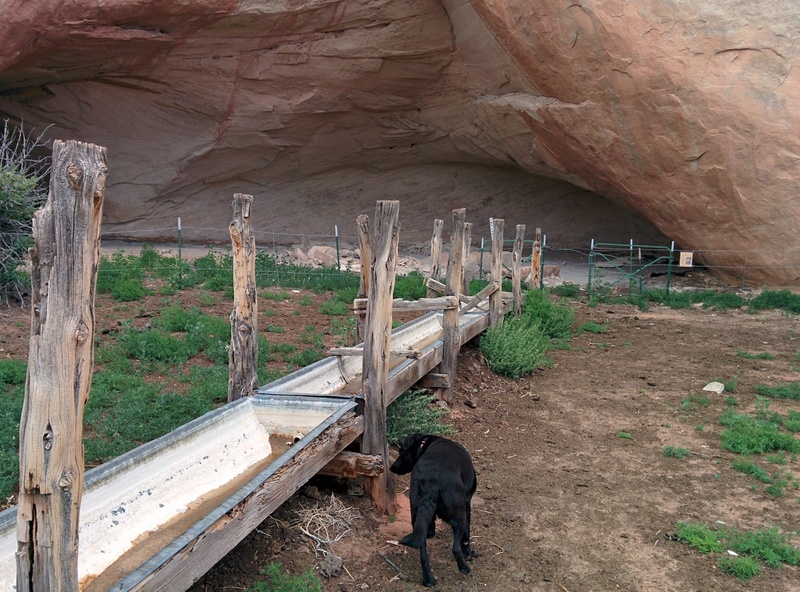 As we crossed the Colorado River on a modern, concrete bridge we could see the remains of an old, mostly destroyed bridge over to our right and made a quick stop to explore the original Dewey Bridge. Once we finished with our historical lesson in bridge building and unintended arson we crossed to the other side of the highway from where we had turned in to see the north end of the old, burned bridge. Once on the barely improved “road” named Owl Draw Upland we took a few minutes to air down our KO2s using our automatic tire deflators and then began following the directions in our special trail book above. Within a couple of hundred feet the “road” devolved into more of a suggested route, made up of large chucks of solid, striated rock. The airing down had been performed just in the nick of time. We wound our way up the side of a shallow rock fin and emerged at an old, open gate with a “Please Shut Gate Behind You Sign” on it. The only problem with that was that the gate was both falling apart and was crammed over rocks and into fissures which made moving it by hand impossible. 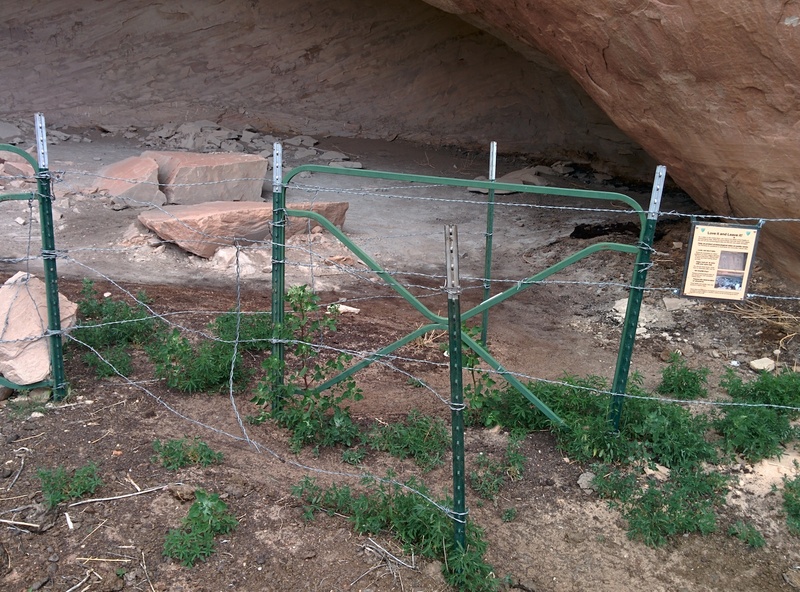 We tried, hard, but it wouldn’t budge and so we gave up in hopes that if the landowner or person running cattle in the area had really wanted the gate closed they would have known about its state of disrepair and fixed it long ago. Onward. 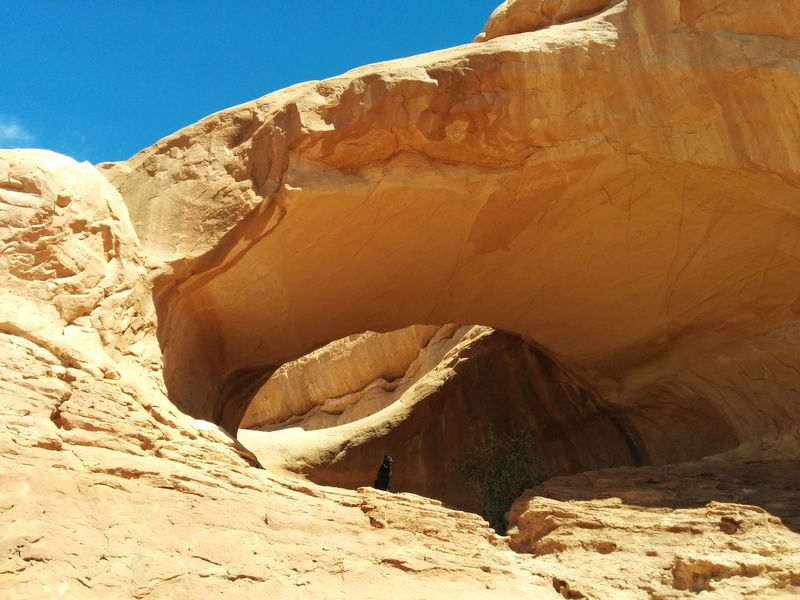 All of a half mile from there we found and took a side road that led to this lovely, shady, protected spot that would, quite possibly, sometime far in the future, become another natural sandstone arch. It had obviously been used as a campsite in the past. It was clean but there was a fire ring and so we made a note to give it a try next time we are in the area. As we were pulling away from that spot full of geologic possibility and heading out its short access road we could see some dust further along the trail in the direction we would be heading. We soon caught up with a couple and their dog in a nicely outfitted and obviously well-used older jeep. They pulled to the side and we stopped and exchanged quick pleasantries before they let us pass. We pulled ahead and away from them with a sense of purpose because, you know, when you pass someone or they pull over to let you pass it is your Duty to prove to them that they were driving so slow they could drive Miss Daisy or that you were worthy of the nicety on their part. Plus, in an off-road scenario nobody wants to eat the dust of the vehicle in front of them and so we were doing them a solid by getting out of there and allowing our dust to settle before they followed in our tracks. We’re thoughtful that way. In this case it was kind of all of those reasons. They were soon out of sight of our rear view mirror and we were congratulating ourselves on such fine off-road etiquette when we came to an abrupt halt when the trail essentially disappeared before our eyes. The book and our odometer informed us this was the ledges or “The Staircase” heading down into Yellow Jacket Canyon. Going straight seemed precariously steep and after a quick look-see we decided to take what we thought would be the more sensible route around to the left and down the ledges at an angle. That was almost a really bad mistake which you can see at around 30 second mark in the video below. I don’t actually know what the official rollover angle is on a Tacoma much less one with a shell and stuff stored up top but everything being equal, and zero inertia, physics says 45+ degrees and we were obviously too close to that. Willow woke up and gave me an annoyed look that I had made her shift and woken her from her beauty sleep. The people we had passed earlier had since caught up and watched our descent from above. After the white-knuckle moment they drove down and joined us at the bottom of the ledges. They told us we were really close to rolling over and I was smart to have gone as slow as I did. Looking back up the ledges we could see that they were not as bad as we had originally thought and so we will take them straight on next time…but still slow. 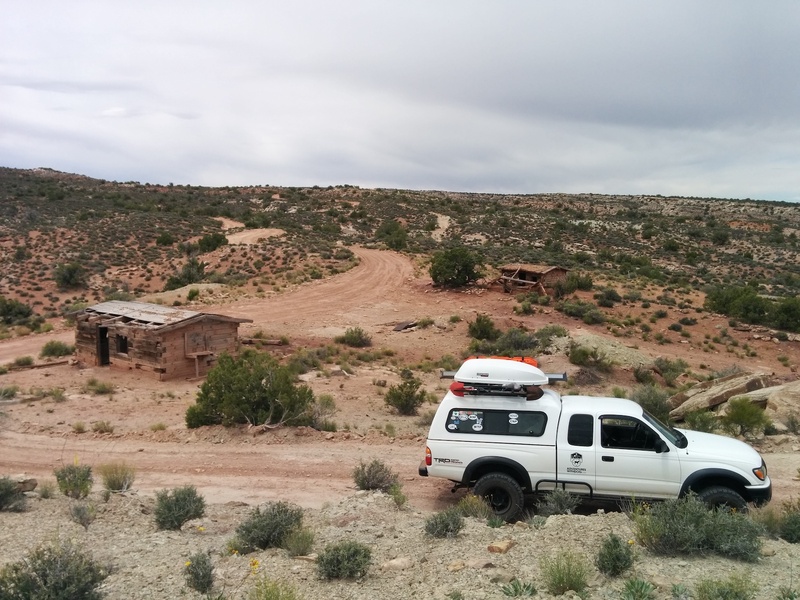 About 5 miles later, through a 4-way trail intersection and some steep, sandy, 4-wheel low and using the rear locker climbs we arrived at La Boca Arch. 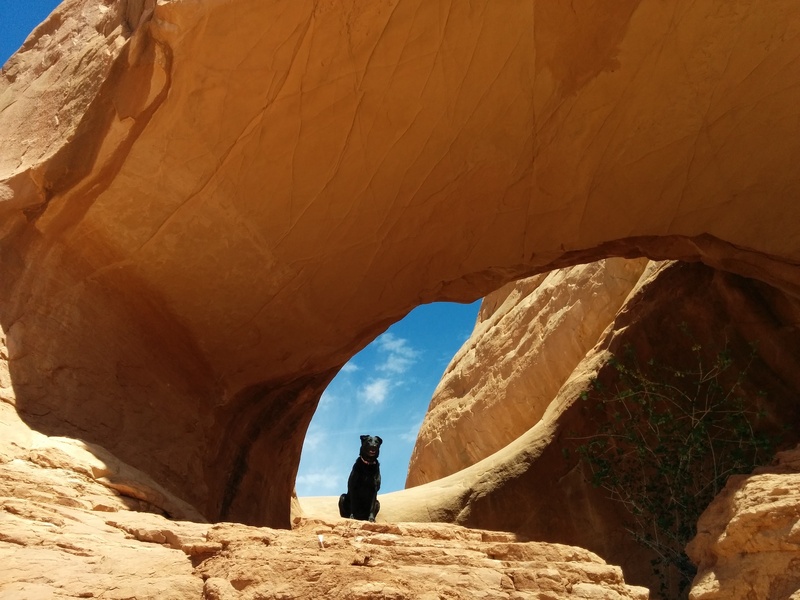 We parked and hiked over to the arch itself and the nice shady spot at its base. After a quick water break I made my dogbert Sit & Stay and quickly scrambled down to take a couple of arch/dog shots. From La Boca Arch we headed back the short half mile or so to the intersection and took the left. The scenery ahead of us soon opened up into a relatively flat valley and out in the distance we could see some big, dark openings along the front of a huge chunk of rock. 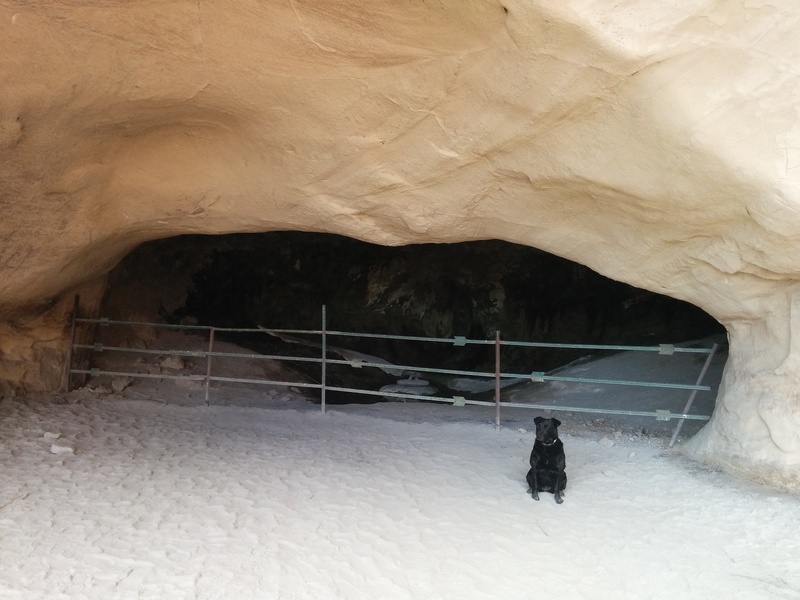 About 2 miles later we pulled up to the front of Caves Spring. 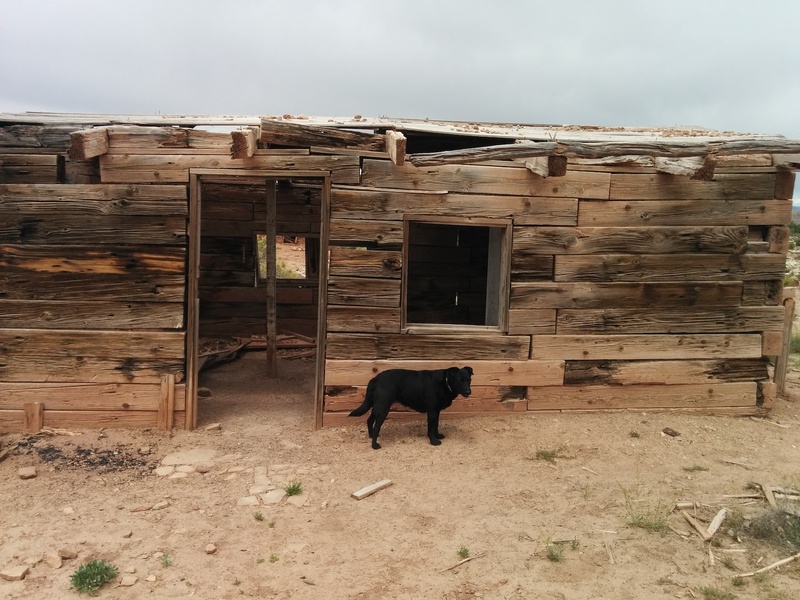 We got out and explored on foot and paw and saw extensive evidence that this natural water source has been used by cattle ranchers for decades. It seemed to have been at least a few months since cattle were actively being watered here. Willow has met, known, sniffed, rolled in their poop and played with cows before and she was spending way too much attention sniffing the trough so we are sure that in the absence of active cattle operations tons of local wildlife makes use of this facility and that gave Willow a whole bunch of stink to sniff. She was in her glory. Sadly that fence switch back also seemed to have acted as the baby cow version of a yellow jacket trap – one way in and unable to find their way out. 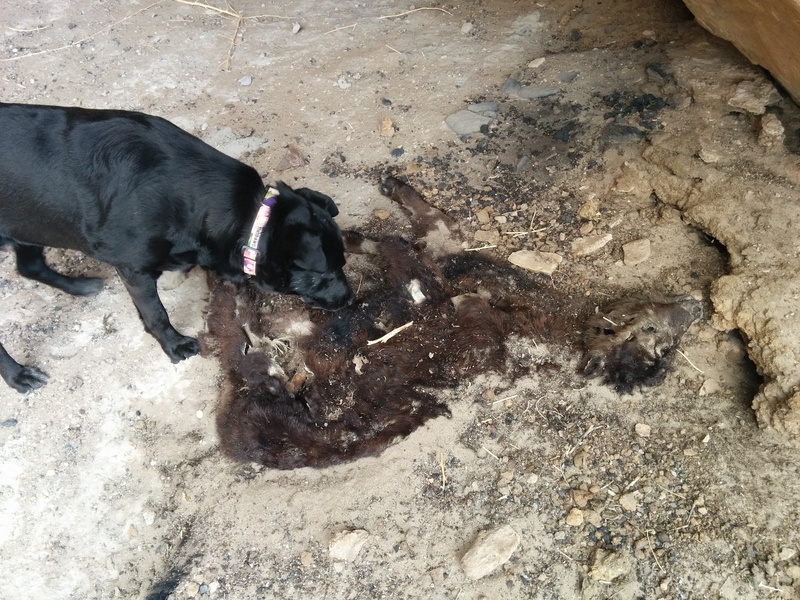 The dead baby cow was about Willow’s size which means probably only a few days old when it wandered in and got trapped and had been dead for several months at least. 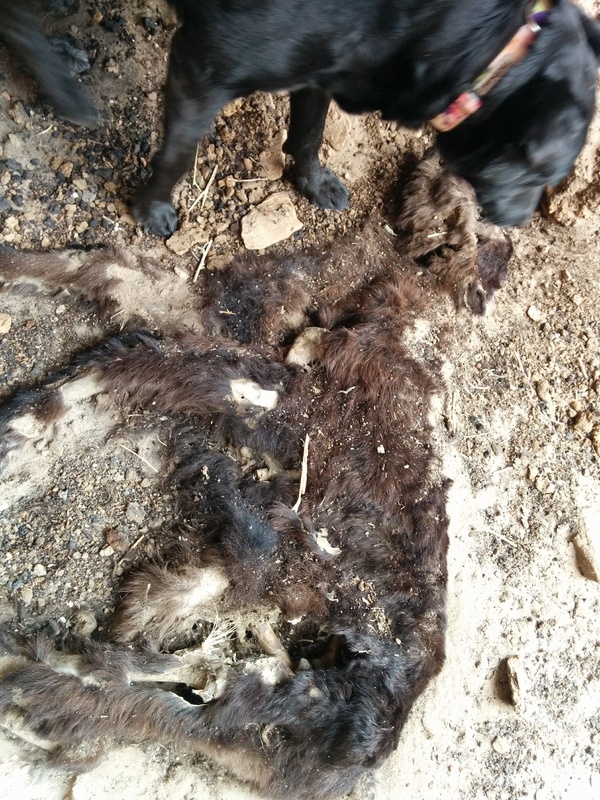 Reader beware, if the sight of a badly decomposed baby cow carcass will cause you undue stress please close your eyes and scroll down a couple of pages. I had a brief moment of sadness imagining the baby on one side of the fence bleating for its mother and the mother bellowing and unable to get to her baby on the other side of the fence. After hours of that the baby got hungry and tired and in a day or two gave up, laid down and died. Who knows what its mom and the herd were doing during all that noisy commotion. Yes, I have an active imagination. Willow on the other hand just thought it was a stinky mess that needed to be rolled in and when I loudly disapproved of that plan she compromised and spruced it up with her own special additive. Yes, that is right, she peed on it. Good girl. Sadly and predictably, when there is a surface that can be written, scratched, or carved upon some douche vandal always seems to automatically think we care that he, she or they were here before. 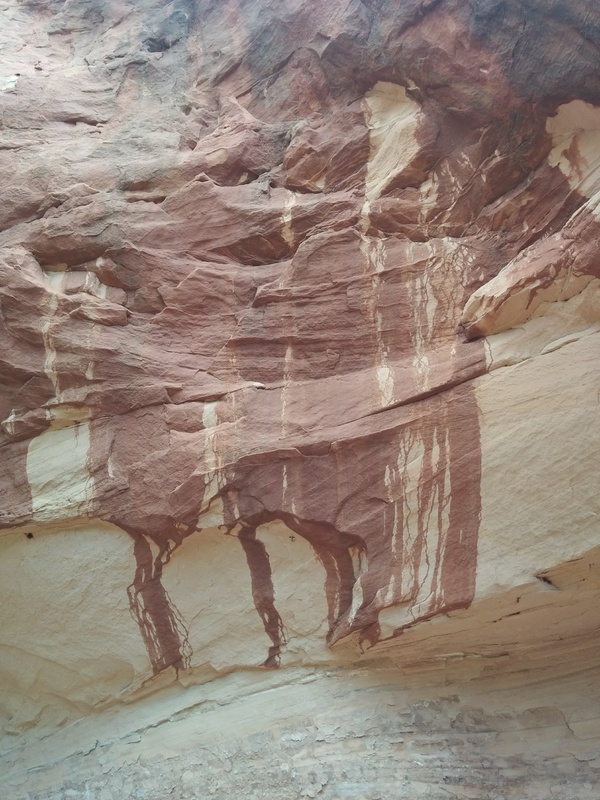 We found some marks like blood dripping down the walls that greatly reminded us of our visit to Echo Amphitheater. 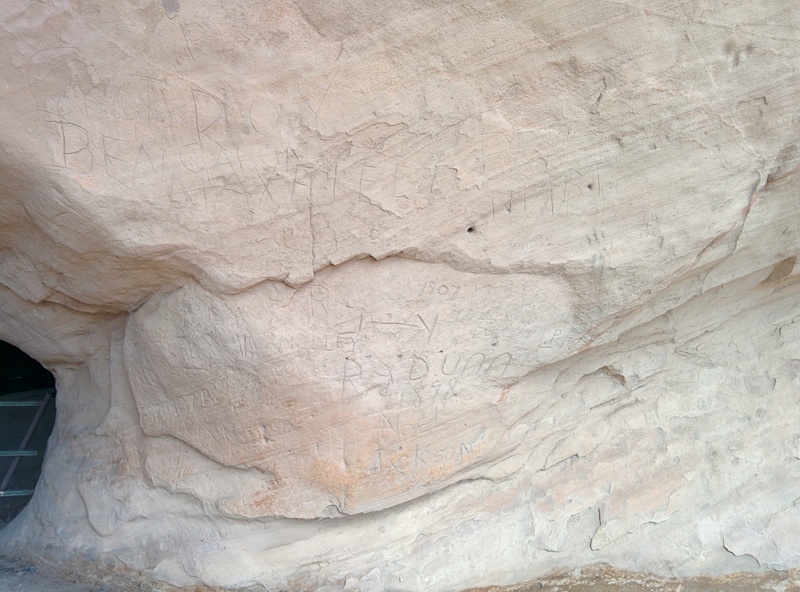 Because of our research after that visit we know this is not, obviously, blood trails but instead an instance of Desert Varnish which is a mix of iron and manganese oxides that have leached out of the ground from above and trickled down the face of the wall over hundreds of years to leave their mark. Science is sometimes boring compared to an active and morbid imagination. 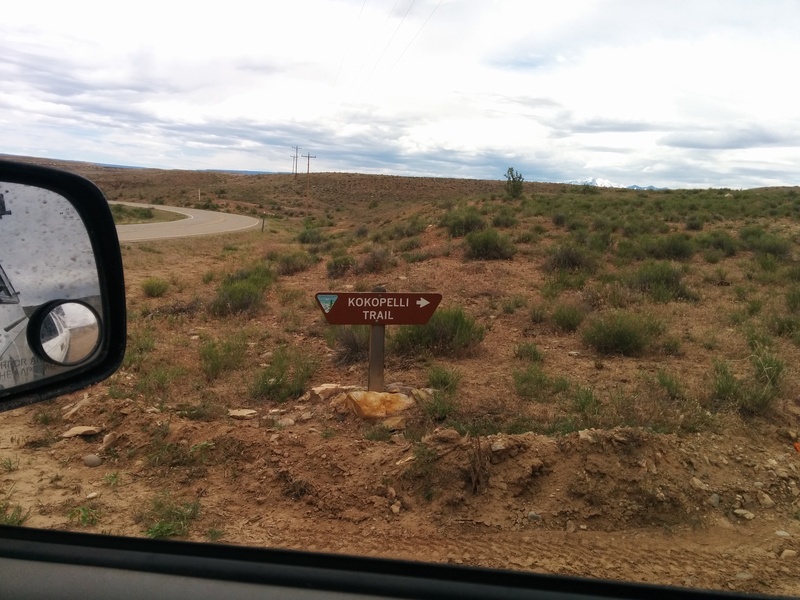 We headed back out on Owl Draw Road and had to carefully follow along with our book’s turn-by-turn directions as “road” signs are extremely few and far between. 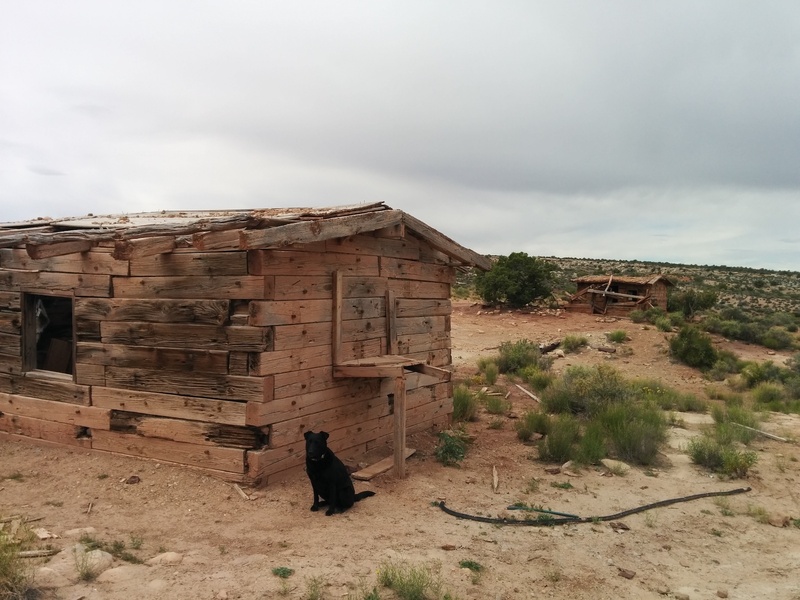 Although it was only about 3.2 miles away it took us a good hour to comfortably drive to our next destination, some impressive old mining cabins. On our way there we saw this large piece of black plastic laying under a bush along the side of the road and stopped to take a look and maybe collect it and dispose of it properly. 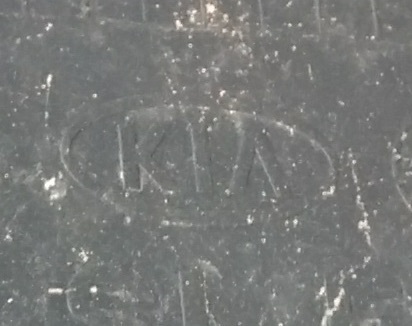 A closer look told us that this came from some vehicle made by Kia. It boggles the mind that someone was driving so inattentively that when they hit a rock or berm and (should have) felt/heard something obviously large fall off and slam around under their vehicle they just kept driving and hoped for the best. What, do they have their fingers in their ears singing “la la la La LA” so as not to think about what just transpired with their “quality” daily driver? 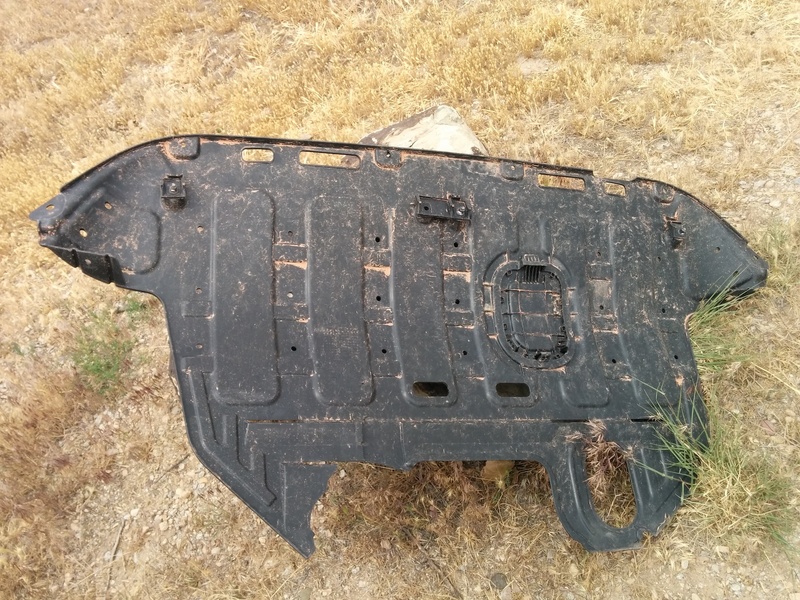 So, and we’re just guessing here, but apparently Kia Motors thinks a thin, flexible piece of black plastic is enough underbody protection for their vehicles when driven off-road. 1) This is incorrect. 2) I nicely let them know about this egregious oversight and they promptly ignored me. 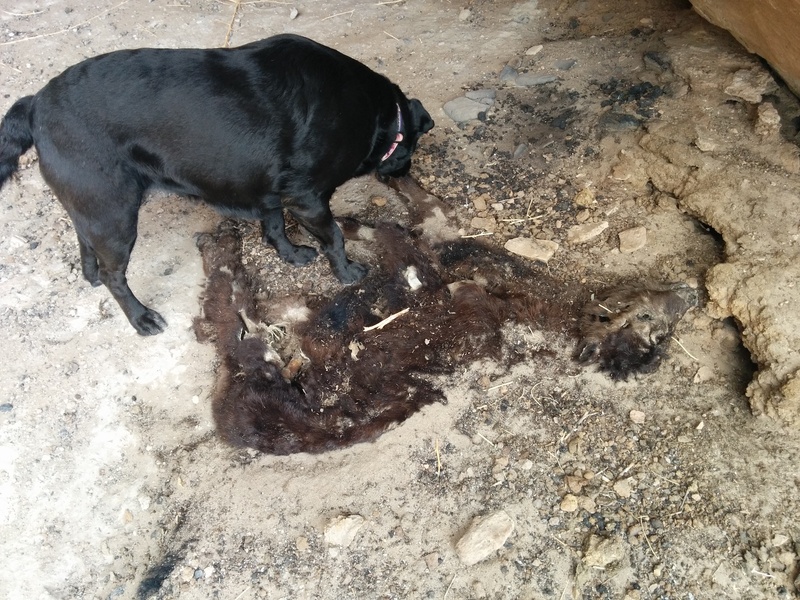 3) I then followed up asking that perhaps they might consider informing their owners that pieces of the undercarriage might fall off of their vehicle at a moment’s notice if driven somewhere you cannot buy groceries and they quickly ignored that as well. I am still waiting for a reply. Not gonna hold my breath. All this makes us think Kia does not care if their vehicles leave large pieces of themselves behind littering up this and other lovely, non-paved landscapes. Maybe this is a shrewd corporate ploy to get people to buy replacement parts although if their drivers are as inattentive as the one who left this expensive piece behind then…maybe not. Corporate responsibility in (in)action. We took it with us anyway and ended up tossing it in a dumpster in a campground back along the highway later that day. So…cabins. Yes we were talking about old mining cabins. These things are stout. 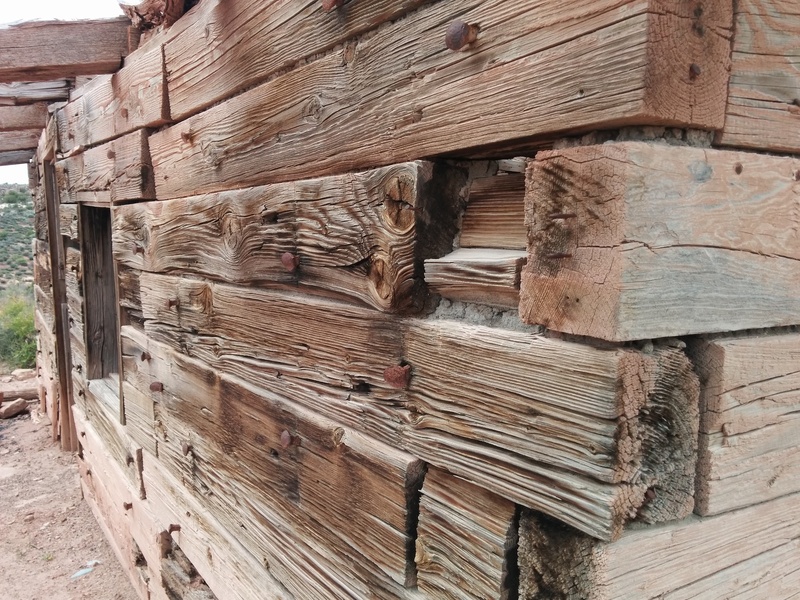 They look like they were made out of railroad ties and spikes or at least 8×10-sized boards. We didn’t venture inside as these looked like all the other old, wooden cabins we have visited with the possible exception that they did not have a sign out front warning us of possible Hanta Virus or Plague nastiness inside. We’ll err on the side of caution when dealing with hemorrhagic and other deadly viruses. From the cabins it took a little over 20 minutes to finish our trek along Owl Draw Road to where it emerged at Hwy 128 in the hamlet of, unsurprisingly, Owl Draw. As we stopped for a minute to get our bearings and figure out our next move we saw posted right next to us a sign indicating that we had spent a portion of our day following along the Kokopelli Trail. This was a short 2.5 miles above where we had originally started out on the Dome Plateau Trail. Since we had begun our adventure earlier in the morning it was only about 1pm and so as we headed back towards our campsite in the shadows of Castleton Tower we decided we had time to explore the Onion Creek, Fisher Towers area but we will leave that adventure for another post. Considering the amount of natural beauty, geologic wonders and human history we had seen along our route we would highly recommend this to anyone visiting the area with a sense of adventure and a high-clearance 4×4 vehicle. Our guidebook considered this a Moderate route and we agree. You do not have to be a hard-core offroader with a 4×4 that you have spent as much on upgrades and accessories as you did buying the vehicle. A stock Wrangler, Tacoma or the like will do just fine as long as you don’t force the issue and push too hard. Letting the suspension do its thing and maybe airing down the tires so that you have a more comfortable ride are all that is needed (oh, and food and water) for a successful trip. Our AT&T phone had essentially no service during the whole day so you might want to take that into account as well.